The redesign to South Florida Foot & Ankle Centers’ website adds over 100 pages of details about foot and ankle conditions, symptoms, causes and treatments. We wanted our website to reflect the depth of treatment options available at our foot and ankle centers and also showcase the amazing talent, experience, and expertise of our staff and podiatrists. The podiatry foot and ankle specialists at South Florida Foot & Ankle Centers have re-launched its website with a new design and added over 100 pages detailing the conditions and foot injuries that they specialize in treating. The website is now a comprehensive resource for anyone seeking a podiatrist in South Florida; it showcases the expertise of the foot and ankle doctors who specialize in clinical diagnosis and treatment of athletic foot injuries and foot conditions that are common in South Florida’s active and aging communities. 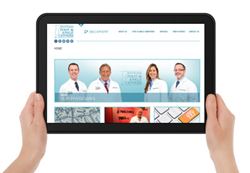 The newly designed website also provides information on the innovative treatments that the podiatrists at South Florida Foot & Ankle Centers expertly provide for their patients. If you are not sure what to expect during a podiatry visit, the website explains in detail how conditions are diagnosed and what to expect during an office visit and treatment procedures. Cutting-edge diagnostics and treatments are utilized for pain and injuries of the lower extremities, such as platelet rich plasma (PRP) therapy to promote faster healing, laser nail treatment for toenail fungus and sclerotherapy, a treatment to reduce varicose and spider veins. The website also explains how their foot and ankle offices provide custom orthotics, orthopedic shoes and diabetic shoes, as well as other products that the podiatrists might prescribe or recommend for patients. With podiatry centers located in Royal Palm Beach, Palm Beach Gardens, Lake Worth, Belle Glade, Port St. Lucie, and West Palm Beach, South Florida Foot & Ankle Centers serves to meet the needs of those with foot and ankle conditions. Our South Florida podiatrists work with patients to understand their needs and provide optimal treatment for their foot and ankle issues. For more information, visit wcfoot.com or call 561-793-2700 to schedule a consultation today.